my SqueakJS VM has reached a major milestone. It is now sufficiently complete to run a full Etoys image (and possibly other non-closure images, too). It has support for most BitBlt modes, WarpBlt, even some Balloon2D rendering (for TTF fonts), a virtual file system, image saving etc. The German Squeak Association (Squeak e. V.) had its annual meeting on May 17. For the second time, the meeting was hosted by the Software Architecture Group at the Hasso-Plattner-Institut in Potsdam. Before the official part, attendees of the meeting were given the opportunity to demonstrate their Squeak projects. First, Tobias Pape and Arian Treffer, students of HPI, demonstrated SwaLint, a source code checker for Squeak. SwaLint is intended as a successor to SmallLint and, thanks to its flexible plug-in architecture, supports running SmallLint checks seamlessly. SwaLint can be configured in great detail: thresholds for all kinds of values can be set, and output can be filtered. 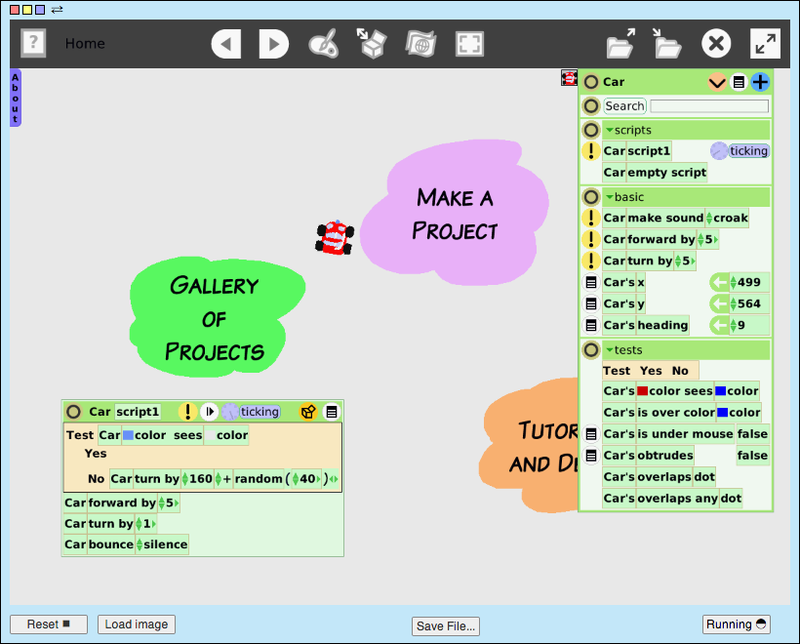 Users can easily implement their own plug-ins for the tool. Next, Michael Haupt (HPI) gave a brief demonstration of SqueakFS, which was implemented by Johan Björk and Eskil Andréen from Stockholm University, Sweden. SqueakFS makes the contents of a running Squeak image available as part of the file system. Currently, it is limited to read-only access, but the image can already be viewed from three perspectives: all classes as a flat collection, assorted by category, and by class hierarchy. Robert Krahn presented SqueakSVN, which is an ongoing development effort in the Software Architecture Group at HPI. The purpose of SqueakSVN is to make Subversion version control available to Squeak developers; it is able to import Monticello projects. SqueakSVN will be released in June. Martin Beck is currently working on his MSc thesis in the HPI Software Architecture Group. His work is dedicated to implementing NXTalk, a Smalltalk virtual machine for the Lego Mindstorms NXT platform. Development of NXTalk application takes place in a Squeak image, and assembled NXTalk images are transferred to the NXT for execution by the dedicated NXTalk VM. In the current state, simple images can be assembled and run: Martin demonstrated a program that can be used to steer a simple NXT bestowed with two motors. The popular introduction to the Seaside web application framework that was produced at HPI was briefly presented by David Tibbe, one of its co-authors. Robert Krahn had another appearance presenting the collection of games for the XO laptop developed by HPI students. All of the games are available for download as project or SAR files. Finally, Carl Friedrich Bolz (Düsseldorf University), Adrian Kuhn (University of Bern), and Toon Verwaest (University of Bern) presented SPy, their ongoing effort to implement the Squeak VM in Python using the sophisticated PyPy tool chain. SPy is currently lacking GUI and other I/O support, but is able to load images and run the tinyBenchmarks. Right after the Squeak association meeting, a PyPy development sprint in Berlin will, amongst others, bring new improvements. After the official part of the association meeting, special guest Dan Ingalls gave a demonstration of Lively, his current project at Sun Labs. It looks and feels, admittedly, a bit like Squeak in disguise, but in Dan’s opinion, there is nothing bad about building the “same” system several times if it’s cool. That is certainly true for Lively. Tags: Demo, HPI, Squeak e.V. On 15/16 May, the workshop on Self-Sustaining Systems (S3) took place at the Hasso-Plattner-Institut in Potsdam. An exciting event at a beautiful place, it featured invited talks by Ian Piumarta, Dan Ingalls, and Richard P. Gabriel, and five presentations of reviewed papers that approached self-sustainment from different angles. Dan Ingalls gave an interesting Tech Talk on the Lively kernel (best viewed in Safari 3 apparently) at Google a few weeks ago – what better way to (re)introduce our new board member?